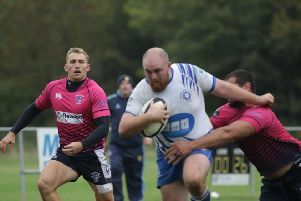 Peterborough Lions head coach Darren Fox and his chairman Andy Moore were singing from the same hymn sheet on Saturday after a disappointing start to the new National League season. The city side were pipped 21-20 by Division Three new boys Derby at Bretton Park after conceding a try two minutes from time. And that match-winning score came after the Lions had done so well to turn a 16-5 half-time deficit into a 20-16 lead. But while Moore and Fox were both disappointed to lose the opener in such a way, they agreed better times lie ahead. Moore said: “Take nothing away from Derby. They are new to this league having won promotion last season and they were certainly up for it. They definitely played with a lot more fire in their bellies than we did in the first half. “However, although disappointed, I’m certainly not distraught because I know we’ve got the quality within our squad to do so much better. “We just didn’t play well enough as a team on the day. We made a very slow start and that ultimately cost us. “I know we will defintely play much better than that,” he said. “It wasn’t the best of starts but the important thing is how you bounce back. We have to work out where we went wrong and put it right - we have to turn negatives into positives. “Out biggest downfall was giving away too many penalties - 18 in all. You’re always going to struggle to win a game when you give that many penalties way. “We did well to get into a winning position but then poor discipline and being over-eager in our own 22 cost us. We were a little bit naive towards the end. “They scored their winning try from a scrum close to our line and the only time they had us under pressure was from scrums close to our try-line. They never looked like breaking our defensive lines. The Lions try-scorers were new signings Joe Andresen and Tom Aviss and prop Ben Howerd while the players sin-binned were Marius Andrijauskas and Jack Lewis. The Lions are at Lichfield on Saturday and will be without ex-Cardiff Blues centre Jonathan Hill. The newcomer was injured against Derby and will be sidelined for a month. But Vernon Horne and Will Carrington return to the squad after missing the Derby game. Last season the Lions did the double over Lichfield - 43-0 at home and 50-35 away.